Once you have heard of Vietnam, the country with the popular S-shape or the dragon-shape, you may have known its capital the "dragon-eye" site: Hanoi. This beautiful capital strategically situates at the center of the triangular basin of the Red River. With around 3.5 million people, and an area of 920 square kilometers, Hanoi is now the country's center of economy, politics, culture, and society. If you have chance to visit Hanoi, you will be attracted by the antique beauty of historical and cultural sites. 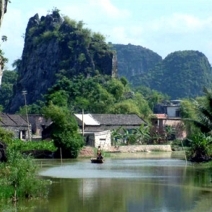 Scattered around Hanoi are places of sightseeing, which are so much attractive thanks to green land full of streams, rivers, and mountain, such as Tam Dao, Con Son, Kiep Bac, etc. The most popular beauty spots in Hanoi are peaceful lakes and Hoan kiem lake Hanoi is one among the most famous ones. Surrounding all the city's lakes are great and high green trees with large shadows on sunny days. Also, they are sources of inspiration for artists. The famous Hoan kiem lake Hanoi (mentioned above), West Lake, Truc Bach, Bay Mau Lake, etc., are the undeniable green, fresh, and peaceful beauties of the capital. Water Park near West Lake is another site of must-visit destinations with all colorful and playful water games to play. This is really suitable for children. But it is strongly suggested that they should always be accompanied by their parents when playing strong-feeling games there! A green and peaceful Hanoi, a fast-growing hospitable city with great tourism potentials, is now open and warmly welcome friends from all over the world. With a number of excellent hotels and accommodations, Hanoi offers international guests a home-away-from-home stay, luring them to return soon. Staying in Hanoi for along time, you will surely be impressed by all things about Hanoi, from Hanoi street, Hanoi bus, pho Hanoi and many other things which constitute such a beautiful but still antique Hanoi.